Mastiff mixes are often big, bulky and beautiful. Mastiffs themselves are as well loved as they are distinctive. This popular breed of large dog has many fans across the world, but not all Mastiff enthusiasts are obsessed with the idea of pedigrees. In fact, more and more dog lovers – even those with a penchant for Mastiffs – are coming round to the idea that Mastiff mixes might be the way forward. If you’re thinking of going down the mongrel route and just love Mastiffs, you may be left wondering what different types of Mastiff mixes there are? Well, we’ll tell you! Before we do though, let’s explore some of the background of the Mastiff. Tracing the lineage of Mastiffs is a rather difficult task. Different types of the breed have cropped up across the world, going back millennia. The humble Mastiff gets a mention in writings from Ancient Greece, Egypt, Rome and China. Experts think that the breed originated in Asia, though they quickly spread across the globe. Julius Caesar was said to have raved about how well they helped protect their owners during his invasion of Britain in 55BC. Enormous and intimidating yet loyal and affectionate, they’ve proved popular with humans throughout the ages. So it’s no wonder they spread to every corner of the globe. Mastiffs are big, big dogs. They are heavy set, with large bones, wide shoulders, big paws and considerably-proportioned heads. The average weight for a male is around 130-220 pounds and 100-160 pounds in a female. Generally, the Mastiff with have a short fawn or apricot-colored coat. While, of course, each dog is different and is liable to demonstrate its own quirks and personalities, there are similar traits in breeds. Mastiffs are generally considered to be good natured, calm, gentle, brave, steady, protective, dignified and good with children. Mastiffs do tend to shed a fair amount. So, despite their short coats, it’s worth brushing them regularly. Bathing is important too. It is vital that you clean between the wrinkles to avoid any possibility of infection. Exercise-wise, these are not overly active dogs. A mile or two a day is more than enough for your average Mastiff. Of course, if your Mastiff mix’s other parent is an exercise-loving breed of dog, you’ll need to adjust your expectations accordingly. Purebred Mastiffs can, unfortunately, suffer from a number of quite serious health issues. Mixing a Mastiff with another breed should help cut down on the likelihood of any major genetic medical problem, but it’s still very much possible. Heart Issues – Mitral Valve Dysplasia and Pulmonic Stenosis are not uncommon in Mastiffs and even Mastiff cross breeds. Both are due to blood flow issues caused by valves in the heart not being as large and open as they ideally need to be. Elbow & Hip Dysplasia – Around a fifth of all Mastiffs will suffer with dysplasia in their lifetimes. It’s an abnormal formation of a socket over time that causes pain and lameness. Eye problems – Inherited ocular diseases such as Canine Multifocal Retinopathy and Progressive Retinal Atrophy are not hugely uncommon in Mastiffs. Both cause worsening eyesight and possible blindness. Bloat – Also known as gastric dilatation, volvulus and GDV, bloat isn’t fully understood by veterinarians. What is known though, is that it can be fatal. It sounds innocent enough, with excess gas causing a distended stomach. However, it’s far worse than just ‘gas’. Mastiffs, unfortunately, suffer from bloat more than most other breeds. So it’s important to look out for the symptoms in your dog (excessive drooling, retching, a hard and swollen belly, distress, pain). 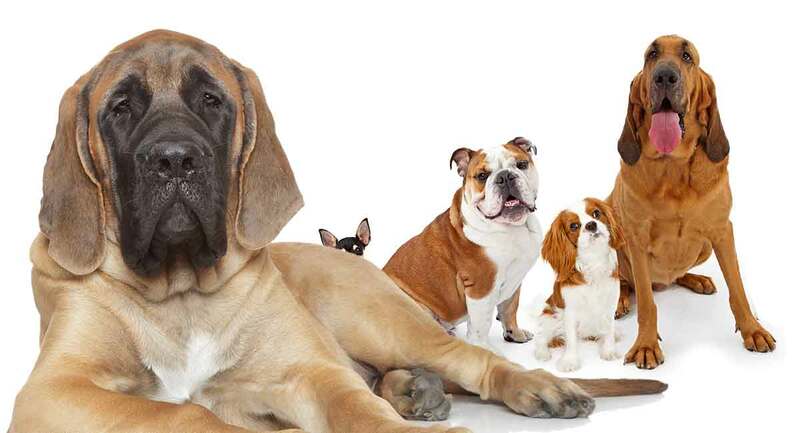 Make sure you get your vet to check your Mastiff mix for any traces of these health concerns. Mastiff Mixes – Why Cross Breed? Dog owners like crossbreeding because it allows them to effectively create a ‘dog cocktail’ whereby they can mix the attributes of different breeds together. People love how it’s possible to effectively make a unique or unusual-looking pet by selecting two separate parent breeds. One major advantage to mixing breeds is that you decrease the chances of congenital health hazards rearing their ugly head. That’s something that, quite obviously, many dog owners find an appealing concept. If you want to learn more about the importance of crossing genetically distinct dogs, this article from the Institute of Canine Biology here explains it extremely well and in some really rather useful depth. The decision is yours to make, of course. The debate is multi-faceted, with valid viewpoints and opinions on either side. For a more detailed examination of the issue, we’d recommend you read this more involved discussion of pedigrees vs. mongrels here. All dogs should be socialized and trained well. But this is especially true with larger dogs. Big muscular canines that are untrained or poorly trained pose obvious issues when out walking. You don’t need us to tell you what can happen when a 200 pound animal decides to pull on the leash! Training a large dog can be challenging, but it’s vital. Make sure you put together a sensible training regime and stick to it. Patience and persistence is key here with obedience training a big dog. But, make it fun for both of you, and you’ll be fine. Generally most purebred Mastiffs will live between 7 and 10 years (although many live longer, of course). Crossbreeds can expect to see that upped slightly. Especially if the other parent dog has a higher expected life span. There are plenty of different breeds of dog that come under the ‘Mastiff’ umbrella. You’ve got Neapolitan Mastiffs, English Mastiffs, Bullmastiffs, Tibetan Mastiffs. The most common Mastiff though, is the Old English Mastiff, sometimes simply called the ‘OEM’. So synonymous with the breed are they that they are often simply – if rather confusingly – known as just ‘Mastiffs’. When a mixed breed dog has parental lineage from a Mastiff and an Akita, they’re likely to be slightly smaller than purebred Mastiffs. That said, they will still be more than capable of demonstrating terrific strength. Likely to weigh anywhere from 80 – 130 pounds, Akita/Mastiff crosses may have longer coats than Mastiffs too. Also known by the name ‘American Masti-bulls’, these dogs are as powerful as they come. That said, they’re often real people-pleasers. Again, the Bulldog in them will likely make them smaller than a pedigree Mastiff. This cross will probably inherit some of the American Bulldog’s wrinkles. So these dogs will require additional grooming and cleaning in between the folds of their skin to prevent infection. Active and friendly, these big mixed breed pooches are likely to weigh in anywhere between 60 pounds to around 150. As with their parental breeds, ‘Boxmas’ (as they’re sometimes called) need very little grooming indeed and can make for ideal pets or watchdogs. Mastiffs crossed with Dobermans are, again, large dogs. This won’t come as a surprise to hear! They’re likely to weigh in anywhere from 90 – 150 pounds. Easy around humans and a cinch to groom, a ‘Mastiffman’ can make for an ideal pet, as long as you’ve got ample room. Athletic and strong, a GSD Mastiff X – as with any cross breed – can take after one parent more than the other. As such, you may inherit a dog with primarily Mastiff characteristics (being affectionate, for example). Or they could be more German Shepherd in nature (more reserved). Weighing anywhere from 60 to 110 pounds, you’re almost guaranteed an athletic and impressive dog. Now you don’t really need us to tell you that crossing a Mastiff and a Great Dane results in a rather large dog, do you? How big? Well, not quite full Great Dane size, but don’t be surprised to see your ‘Daniff’ puppy grow to well over 200 pounds. Despite their giant size, this mixed breed is gentle and friendly, being especially good with children. Sometimes called Irish Mastiffs, crossing an Irish Wolfhound with a Mastiff – once again – creates one of the bigger pets you’re likely to see. As with Great Dane Mastiffs, when you introduce a giant dog into a mix, you can expect puppies of a considerable size. The major drawback of these enormous dogs is their shorter life expectancies. A Mastiff / Irish Wolf cross isn’t likely to exceed a lifespan of 7-9 years unfortunately. Likely to be loving and friendly, a Mastiff crossed with a Labrador is going to be a sizeable pet for any home, but manageable in its scale. You can expect a ‘Mastidor’ to tip the scales at around 100 pounds. If the dog inherits the coat of its Labrador parent, chances are you’ll be looking at a shedding dog. As a result, a fair amount of grooming may be required. Bred and trained responsibly, Pitbull Mastiff mixes (aka ‘Pit Mastiffs’) are loving, caring, affectionate, smart and courageous. Bred and raised poorly though, this mix can be aggressive. Always meet both parents if you can. Mastiffs Poodle crosses are quite popular, perhaps – in part – due to their non-shedding coats. That said, ‘Mastidoodles’ aren’t guaranteed to be non-shedding. It’s difficult to predict just how large or heavy a Poodle Mastiff will grow to be, but expect anywhere from 50 to 100 pounds. This mix may well look intimidating to anyone outside of ‘the pack’ or family, but with their loved ones, Rottweiler Mastiff crosses are great fun and very affectionate. As you can imagine, they can grow large and as such must be trained well around other dogs and people. Is A Mastiff Mix Right For Me? Not all dogs will suit you and your domestic set-up. Mastiffs are good natured and low maintenance, but there are a few things about them that make them – and their mixes – a little hard work. As we’ve touched upon already, they can be tricky to train. You need to be resilient and determined in order to train in your new dog. The biggest thing to consider though, is just how big they are! These are not small animals. You need to be able to accommodate a Mastiff. That means space. Both inside and out. It’s simply not fair – or practical – to expect a large dog to be able to live in a small apartment, for instance. But if you have the room, the know-how and the dedication, Mastiffs and their various mixes make for wonderful pets. Whichever breed of dog you choose, be they purebred or mix, so long as you’re knowledgeable, patient, loving and willing – you’ll build a great relationship. If you’ve got a Mastiff or a Mastiff mix, let us know your experiences below in the comments!